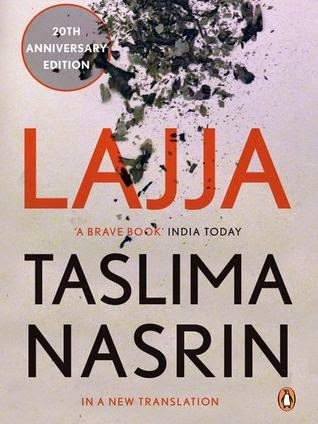 Taslima Nasrin (Bengali: তসলিমা নাসরিন) is a Bengali Bangladeshi ex-doctor turned author who has been living in exile since 1994. From a modest literary profile in the late 1980s, she rose to global fame by the end of the 20th century owing to her feminist views and her criticism of Islam in particular and of religion in general. I had read this book sometime in the late nineties when the reading bug in me was just spreading its tentacles. I remember how upset I was after reading it. My mind kept ringing with so many questions at that time. Till then I always believed that the partition was the most painful incident that our country had to face, but after reading this book I realised that the pain however much segregated was deep and intensified so much that it still hurts to even read about it after all these years. What else would you call it when a book still hurts you as much as it did then purely because of its relevance. Even after two decades of it release, the book still connects with you at a level you never thought of. It speaks to you, looks into your eyes and shows you the dirty mirror of the world around us and trust me when I say "dirty" is perhaps not the right word to describe its murkiness. I still have many questions as I finish reading it today, and yes it still hurts to know that such things do continue to happen. Though it might come to our attention or they might lay buried somewhere deep beneath those debris of souls, hearts and dreams. This is the story of a Hindu family living in Bangladesh trying to make a survival when the Babri masjid massacre happens and it changes their life forever. The author has used such powerful language to depict the extent of violence and agression you are bound to feel her hurt through those words. So many scenes come alive as you try to close your eyes shut for the fear that they might be true. Such is the power of this author! Recommended for people who love history, and are curious to know the answers to a lot of questions that plague our mind about our country, the politics and the current scenario with regard to our neighbouring countries. This book is like Porabarir Chomchom - A 150 years old sweet as it is old, still as tasty (read: relevant)as it ever could be.